I’m happy to give the floor today to Bishop Paul Martin SM sharing his homily at last night’s Chrism Mass for the Christchurch Diocese held at St. Mary’s pro-Cathedral. Take a few minutes to listen to the homily or to read the text printed below. Yesterday afternoon I attended the launch of a new book at Canterbury University, the diaries of Fr. Antoine Garin SM who recorded his experience of being a missionary at a small place called Tangiteroria, a small settlement between Whangarei and Dargaville. And the diaries being published were from the period 1844 – 1846, giving a French Marist priest’s reflections on his life living among the Maori there at the time. Those who spoke at the book launch reflected on the gifts he brought to the people and also the impact of the people on Fr. Garin. From there he went on to Howick to work among the Irish Fencibles and then to Nelson where he worked to establish the church in Nelson and was remembered with deep affection. Many are trying to promote him as a saint. Here was a man who left his home country to go to other side of the world to spread gospel and he was effective in doing this. It’s significant that the gospel reading we have just listened to begins by making the point that Jesus came to the place where he had grown up – Nazareth, to his home territory. We know that later he comments that a prophet is never accepted in his own home. One of the things I have grown to appreciate about diocesan priests is that most of you as diocesan priests are ministering in your home territory. Of course this has some positives but you might often think that the down-side is that from the time you were a child people know you well…people know your parents and brothers and sisters. Some have come to us from other places more recently, from Vietnam, Philippines and India, (and even from the Society of Mary and over the fifty years that you will minister in this local church of Canterbury, Westland and Chatham Islands, you will become immersed in the lives of the people of God in this place. You will grow to know the people you serve and they will get to know you well. This can be seen as an advantage since it’s easy to arrive unknown and new in a place and make a good impression and to be liked by everyone. But as diocesan priests we are called to something different. I say WE here very deliberately – since I too am relatively new. I did not grow up here, but I along with every priest who makes a commitment to serving the diocese of Christchurch for life, am becoming immersed in life here. On the day of my ordination as your bishop everyone seemed happy, I was new and unknown, what could there possibly be to dislike! But now we are living the life of commitment, imperfect bishop, imperfect priests, imperfect people, sinners together in this place, committed for the long haul to living not as business or an institution from which we can easily flee when things get tough or the decisions get unpopular, but as a family of faith. Yes, family is the term Jesus uses of the Church…not a committee or business or institution but FAMILY, sisters and brothers, united by our participation in the body and blood of Christ. And so when we speak people will diminish what we say saying as they did of Jesus….”isn’t this the carpenter’s son….don’t we know his parents…Can anything good come from Timaru or Christchurch or even Hastings. At this point of ridicule and disagreement, of tension and challenge we really begin the adventure of faith, held together not by business contracts but by faith covenant…the strength of which is found not in our yes to Jesus, in baptism or in Holy Orders, but in Jesus’ YES to us. So with Jesus we live the prophecy: “The spirit of the Lord is upon US. A few months ago I watched an old movie clip of a Eucharistic procession at the Cathedral of the Blessed Sacrament in November 1950. Some of you may have been there. The camera was positioned across Barbadoes Street facing the cathedral and the procession leading the Blessed Sacrament flowed down Barbadoes street to the Cathedral grounds like an endless stream of faithful Catholics: Children of Mary and altar boys all robed in front. School children in uniform, Hundreds of cassocked Marist Brothers and habited Sisters of Mercy, Sisters of Our Lady of the Mission, Calvary sisters, seminarians by the dozens and priests by the score. All standing and marching in step, an intimidating army, the Church militant. Proud to be Catholic. The decades that followed saw changes that were difficult for many as we realised that if faith was to mature we needed to move from the external signs of strength and uniformity to a humility of dependence on Jesus. Little could we have imagined that the visible strength and structures of the early decades of last century were hiding suffering, injustice and even abuse which we have seen uncovered in the past two decades. And so the church that once stood strong and militant marching in step has been brought to its knees. And in this humility we find ourselves where Christ needs us not standing proud, but humbly kneeling. The problem with the Church militant and strong is that we too easily trust in our own management and resources and projects. Now we are brought low, to our knees which is the healthy posture for the disciple, and like the first disciples of Jesus after the resurrection we place our trust in Jesus. Left to ourselves we are not sure what to do, but we now have full confidence in Jesus Christ present and alive among us. The Spirit of the Lord has been given to us who are the baptised, because He has anointed us, to bring glad tidings to those who like us are lowly and brokenhearted, proclaiming liberty to those who are captives and prisoners. To comfort all who like us mourn. We all share (as the reading reminds us) in the priesthood of Jesus Christ, yes everyone of us who are baptised have a share in the priesthood of Christ. And some of us have been anointed to be shepherd after the heart of Jesus as his sacramental priests. At this Chrism Mass in a few moments I as bishop will bless the oils which are used as tools of the priestly trade, the Oil of the Sick and the Oil of Catechumens. Then I will consecrate the Oil of Chrism. 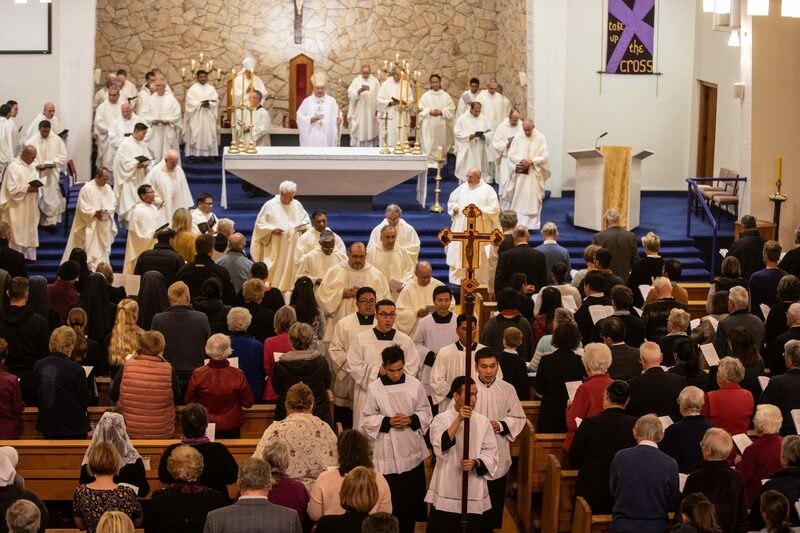 But first I will invite all priests renew their dependence of Jesus the priest, Urging them to be faithful in their office and call on them to renew publicly their priestly promises. As you look on us you will see good and holy men, but you know us well, you know that we are weak and frail, and much of the time we like you are struggling. As your priests renew their commitment pray for them, that they may resolve to be more united with the Lord Jesus and more closely conformed to him, that they may be faithful stewards of the mysteries of God, and that the Lord will pour out his gifts abundantly upon them and keep them faithful. Then pray for me, that I may be faithful to the apostolic office entrusted to me in my lowliness. 11 Responses to "a kneeling church"
Thankyou, Fr John, for giving us this wonderful homily from Bishop Paul. I pray with gratitude for our Bishops and Priests.. I pray for them in all their needs, for faithfulness, for courage, and perseverance. May we all, Bishops, Priests, Religious and Faithful, grow in love of God and in our desire to follow Jesus more closely. Thanks Father for printing this as I was unable to get to Mass last evening. Bishop Paul is a special man, very open and realistic. We are blessed to have him. Wow … that’s all I can say WOW! Wonderful to be able to support and pray with our Priests as they recommited themselves to the Lord and to us the laity for another year. We are blessed indeed to have our wonderful Bishop and Priests.As the Bishop stated in his homily we are now a kneeling humbling church willing to stay on our knees for the God who suffered died and rose for us and in giving us our Priests to kneel all the way with us!! The privilege of humility is a lesson oft hard learned. Life’s trials and challenges might bring us to our knees but our faith and the love of God and His promise is the balm that can truely heal us. Thank you Father John for your constant support. Thank you Father for Bishop Martin’s homily.Much to reflect on when as it is said the “church has been brought to its knees”. On a day of tragedy in Paris with the destruction of Notre Dame Cathedral we must remember that while churches and institutions are important and necessary it is the Catholic Faith and the teachings of Jesus which sustain us and give us hope. Disappointing to see the judgement of the 1950s faith. We may be a more humble church now but I think we are also a less prayerful one (who prays a family rosary nowadays?) and less well formed one (who still knows the tenants of the faith?) and less connected as a family. Would we be a lot more at ease kneeling in humility before Christ if the thrust of the article was changed from us being ‘sinners’ to that of kneeling/seeking God’s help in optimising the gifts He has given at birth? “I am the vine you are the branch, without me you can do nothing…”. Sins, sinning, sinners… on it goes with its negative connotation. Just like we were repeatedly told as children in the middle 1900’s. Let our praying be focussed positively and not on the gut wrenching human errors we make. With God’s help we have the opportunity to erase or eliminate our human weaknesses. Thought provoking, sincere message for the whole community.